This is the second in a series of blogs which get back to the basics of Lean. As I said in my last blog, it seems to me that as Lean gets more mainstream, people are forgetting the basic principles of Lean and are contorting Lean into something it was never meant to be. The worst examples are where people take what they were always doing and re-label the same work as Lean. I’m sure we can all think of many examples of this. What do I mean by Lean? It’s the engagement of all people in driving continuous improvement through the elimination of waste to improve Customer Value. The result is the world’s most powerful business system. Last time I started right at the beginning with Customer Value. Today I’d like to continue with Employee Engagement. Why is this one of the basics? If we are implementing Lean properly, the result will be a win for our Customers, a win for our Employees and a win for the Organization. If there is no win for the Employees, how can we expect to engage them in continuous improvement and drive more value to our Customers? Let’s explore this a bit deeper. It all starts with the principle of “Respect for People”. This is not just respect in the way we talk to each other and the way we interact with our fellow team members. It goes far beyond that. It means using everyone to their fullest potential and allowing and in fact, encouraging everyone to become the best they can be. Employees who are continuously solving problems according to the scientific method are continuously learning and continuously building their capabilities and skill sets. I’ll talk more about the Scientific Method in a later bog in this series. Suffice to say, the result is more valuable employees who can drive more value to our Customers. This type of engagement of employees in solving problems following the scientific method is much different than what is normally referred to as employee involvement. Typically, with employee involvement I see organizations asking employees for their ideas or for feedback on an improvement idea management has come up with. Usually, employees are quite willing give their feedback and to toss these ideas back to their leaders. The Leaders then become the bottleneck in improvement due to the limited time they can spend implementing these ideas. Result – a slow rate of improvement. The type of engagement I’m referring to is one where employees not only surface ideas for improvement but they are the ones to drive these ideas through to completion following a prescribed process in which leaders act as coaches and mentors. Imagine an organization where every employee is making an improvement, big or small, every day. Result – a faster and faster rate of improvement. Just think of the power in that organization! Just think of the advantage that organization has over its competitors as that kind of improvement is difficult to replicate. As leaders what is our role in Employee Engagement? I believe that people come to work as fully engaged employees and our role as Leaders is to keep them engaged and not to dis-engage them. Sadly, all too often, this doesn’t happen. Result – dis-engaged employees and another employee involvement survey and program. Head for the hills. Which organization would you rather work for? I’d love to hear from you. I agree with what you wrote below, but I would also ask that when management is the bottleneck, it leads to discouragement of the employees - the source of ideas and improvements will dry up. Nobody wants to see their idea sidelined or delayed for 'bad' reasons. If management really wants employees' ideas, it has to respect those ideas, and that means limited delays between proposition, consideration, and action/rejection. Excellent point! Employees can get turned off quickly when they see their ideas languishing with an overburdened supervisor. Exactly topic! Its really true. "If we are implementing Lean properly, the result will be a win for our Customers, a win for our Employees and a win for the Organization. If there is no win for the Employees, how can we expect to engage them in continuous improvement and drive more value to our Customers? 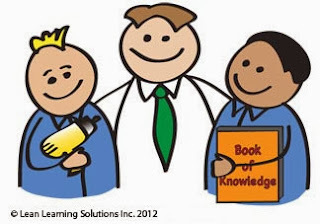 - See more at: http://blog.leansystems.org/2014/06/back-to-basics-employee-engagement.html#sthash.KYIEGKmF.dpuf"